A prostitute writes her life story; good is bad is good and bad. 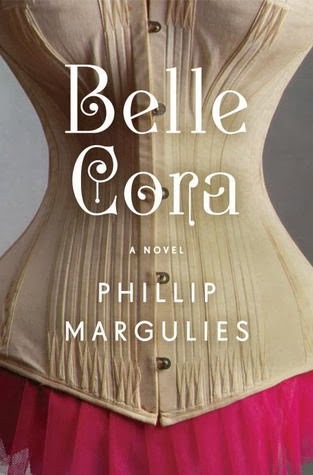 About Belle Cora by Phillip Margulies*: Based loosely on the life of the 19th-century prostitute of the same name, the book is written in the form of a two-volume memoir by one of San Francisco’s richest and most revered dowagers. In it, the heroine tells the story of her moral fall and material rise over the course of the century, carrying her from the farms, mills, drawing rooms (and bedrooms) of New York to the California gold rush. The book opens with a "Foreword to the 1967 Edition" which explains how this autobiography was written by a Mrs. Frances Anderson who is introduced as a "merchant's daughter, a farm girl, a prostitute, a madam, a killer, a missionary, a spirit medium, a respectable society matron, and a survivor of the Great San Francisco Earthquake." Fascinating already, right? The author takes the tale of this fascinating real woman and breathes life into her character in this impressive historical saga. It's an amazing read! This is historical fiction taken to the hilt, the saga of an unlikely heroine that takes one through New York and California during key historical moments. It's engrossing, well-written and extremely well paced that I never felt that I had gone through close to 600 pages. I was enamoured with Belle Cora. While this is a fictionalized version of Belle Cora, I love how Margulies' portrayed her, a paradox of a woman that challenges the mere cliche of a woman gone bad": she's good and bad, she's emotional and she's cold, she's loving and cold-blooded, she's sophisticated and she can be base. Although the synopsis plays up her notorious side as a high class prostitute in New York, the novel reveals how her decisions and actions were the result of circumstances and of the times she lived in. Her relationships are engrossing. The highlights include the tragedies of two loves of her life: childhood sweetheart Jeptha Talbot, and gambler lover Charles Cora. Her family relationships lend a vulnerability to Belle Cora's life story, particularly of her ne'er do good younger brother Lewis, and her cousin and rival Agnes Moody. These people are as memorable as Belle Cora. This wouldn't be much of the story without the historical underpinnings which shape Belle Cora's life. Those interested in US history will revel in the details of life, livelihood, religion and politics starting in the 1820s to early 1900s, from New York to Manhattan to the beginnings of the Gold Rush in San Francisco. There are references to the adventist preacher William Miller's predicted Second Coming of Christ, the California Gold Rush, how prostitutes were among the wealthiest and educated women in the 19th century (see this), the vigilante tradition during 1850s San Francisco, the 1906 San Francisco Earthquake, among others. The scope and breadth of this novel is impressive. This novel has the feeling of a modern classic with its timeless lessons, realistic and dynamic portrayal of characters, and the historical detailing of the US during the course of almost a century. I am impressed that Margulies pulled it off with such charm, with a deep respect for the complexity of characters and the eras he describes ... all the while never allowing the reader to feel bogged down. If you're intimidated by chunksters, then yes, this is intimidating. I had issues with how slow it was in the beginning. I chugged along though, as I always do, and it picks up. Rest assured, these earlier details lay the groundwork for the novel. On both points above, all I can say is, commit to it because the payoff is amazing! You need to read this. Believe me, I think this is one of those few reads where I went "WOW!" then needed to just sit still and let it all sink in. I feel honoured to have read Phillip Margulies' debut novel (and as an advance reader copy, too) ... this is a star of a book and I suspect it will gain many accolades -- and rightly so--from readers and authors alike. I received an Advance Reader Copy from the publisher in exchange for an honest review. Terrific review. I want to read this. THANKS for sharing. I love the cover too. Stopping by from Carole's Books You Loved February Edition. I am in the list as #29. My book entry is below. There are also two giveaways on my blog. Check them out if you like.